F DeMarcus Cousins, 6-11/270, Fr. F Patrick Patterson, 6-9/235, Jr.
G Eric Bledsoe, 6-1/190, Fr. G Darius Miller, 6-7/223, Soph. G John Wall, 6-4/195, Fr. F Daniel Orton, 6-10/255, Fr. G Darnell Dodson, 6-7/215, Soph. G DeAndre Liggins, 6-6/195, Soph. 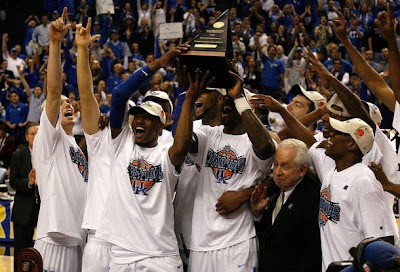 This team rebounded from being a team in the NIT last year to a number 1 seed in the NCAA Tournament in 2010, and they did it with multiple talented underclassman and a new coach in John Calipari. Kentucky has an insane amount of talent with DeMarcus Cousins the crazy athlete,John Wall the speedy point guard,Patrick Patterson with a inside outside game in 2010 and tons of talent off the bench. The question with Kentucky is if they can keep their focus for whole games and also that they don't play down to their opponents.